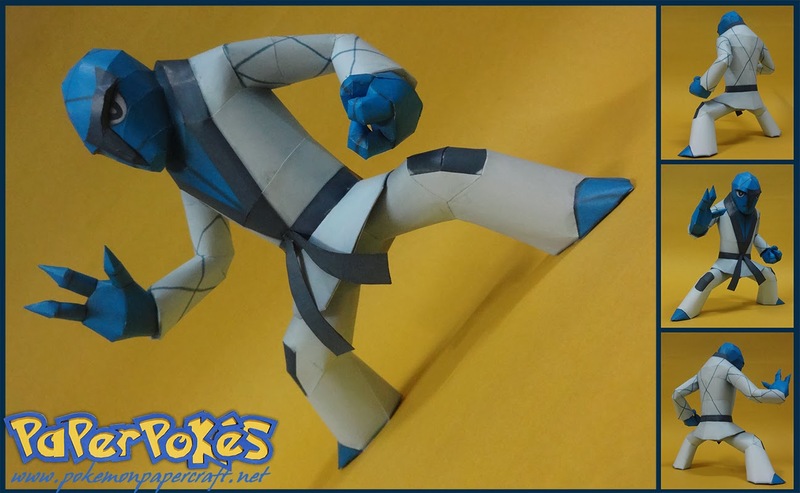 Interesting Facts: Sawk is a bipedal, humanoid Pokémon with a lean, blue body and rocky skin. Its head is oblong-like and low on its shoulders, with an ornate sideways z-shaped black feature that forms its nose and its left brow. Its hands and feet each have three digits, with its feet and toes coming to a sharp point. It wears a light blue Karate gi with a black, v-neck collar that extends down to its black belt. Sawk will tie this black belt to increase its power. The gi has an integrate diamond pattern is its sleeves and a black, square patch on the bend of its knees. Sawk is found secluded in the mountains where it trains to increase its strength. It becomes angered if it is interrupted while training. This Pokémon is an all male species with no female counterpart. NOTES: Start the model at the head and work down, closing the torso at the bottom. The legs are built from the bottom up, close them at the top and join to the body before gluing the belt to the model. The hands are simple, join them to the body after it's built. This was posted the day before my birthday. Technically it was my birthday, but Australia is half-a-day-ahead (I'm Australian) BUT I'm in Europe now so that complicates things. About the model: was expecting more Megas, been waiting for Sawk for quite a while. Thankyou for posting it.